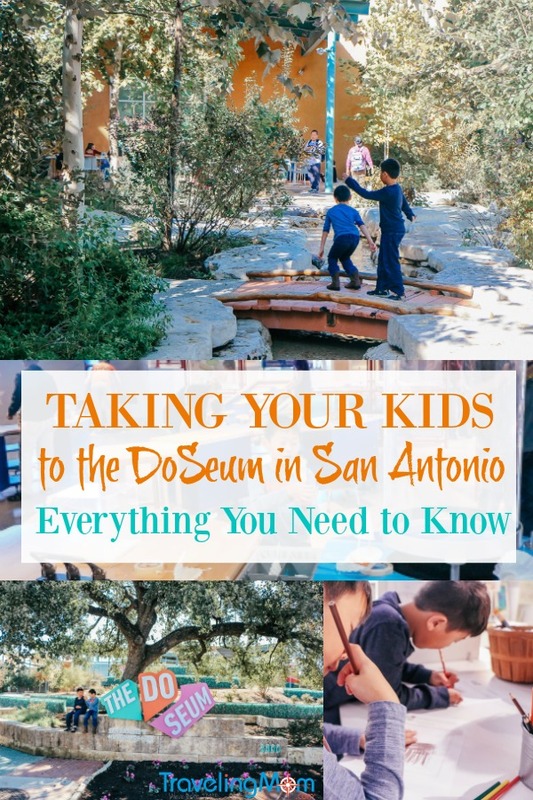 One of the most popular attractions for families in San Antonio is the DoSeum. The DoSeum is a museum for kids full of indoor and outdoor activities that emphasize hands-on creativity and learning. Of course, kids don’t realize what an educational gem this is…for them, it’s just fun. 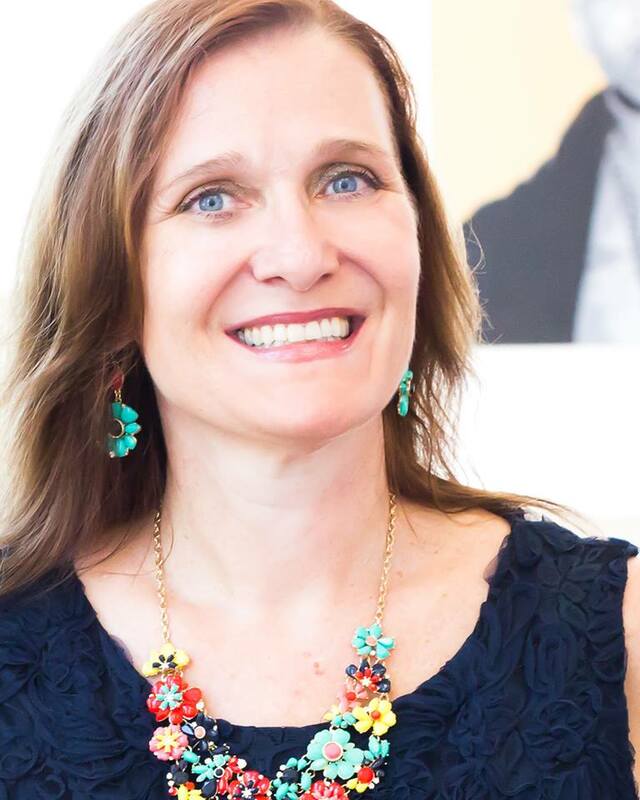 And, that’s perfectly OK. Texas Traveling Mom Jill is lucky enough to have The DoSeum right in her back yard and offers expert tips on how to do the DoSeum. I am lucky to live in such a beautifully diverse city as San Antonio. There’s so much culture, so much variety and so much humidity. No matter what your family likes to do, we have it here. My favorite thing is when someone asks me for suggestions on things to do when visiting San Antonio with kids. The DoSeum is always on my list of recommended activities. My kids love it…it’s a very welcoming place that manages to be stimulating without being overwhelming. Here’s everything you need to know about how to do the DoSeum and have a great time. 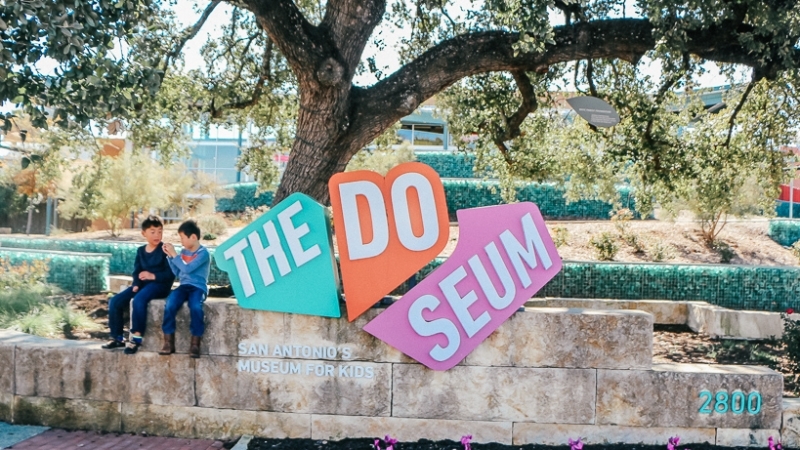 The DoSeum is situated on 5.5 acres at the corner of Broadway near Mulberry, across from Lions Field and just north of downtown San Antonio, Texas. The address is 2800 Broadway, San Antonio, TX 78209. The DoSeum is pretty centrally located and easily accessible from wherever you are staying in San Antonio. Admission is $14 per person over the age of one. Free family nights are currently on the first Tuesday of every month from 5:3o – 7:3o p.m. Prepare for crowds and a busy parking lot. Parking is free. The DoSeum offers 240 free spots and they ask you to avoid parking at the nearby Lions Field and Kiddie Park parking lots. If you are interested in membership, click here. As a member, you’ll receive unlimited admission plus a member’s only hour (Sunday’s from 11:00 a.m. until noon) as well as other perks and discounts. Premier members enjoy reciprocal benefits to ASTC and ACM attractions. The DoSeum offers discounts to military, educators, and seniors. When the DoSeum is busy, you may have to circle a few times for a parking space, so if you’re visiting at a peak time, be prepared for that. The DoSeum is busiest on school holidays and free family nights. We visited most recently on Black Friday and the DoSeum was very busy. The DoSeum is also popular with school groups during the weekdays until 2:30. If you like, you can call ahead and ask if any groups will be visiting when you’re planning to go. The DoSeum Store has lots of fun and unique gift items and games. They also sell diapers, sunscreen and phone chargers. They offer an on-site cafe, Bakery Lorraine at the DoSeum. You’ll find healthy snacks and kid-friendly meals as well as a variety of beverages. You’re allowed to bring small snacks and bottled water in with you. The DoSeum has changing tables in both male and female restrooms and also in their family restrooms. Moms are welcome to nurse anywhere in the DoSeum. The DoSeum is fully handicapped accessible. Visitors and native San Antonians appreciate a good indoor activity, especially during the warmer months, which is pretty much always. It’s usually uncomfortable to be outside during the heat of the day in summer, unless you’re floating in a pool or one of our nearby rivers. Air-conditioned fun is a good thing. There are two levels in the DoSeum. The three activities in the entryway (wind tunnel, kaleidoscope and other thing) tend to get a little congested when the DoSeum is busy, so if there is a bottleneck, skip these and come back later. 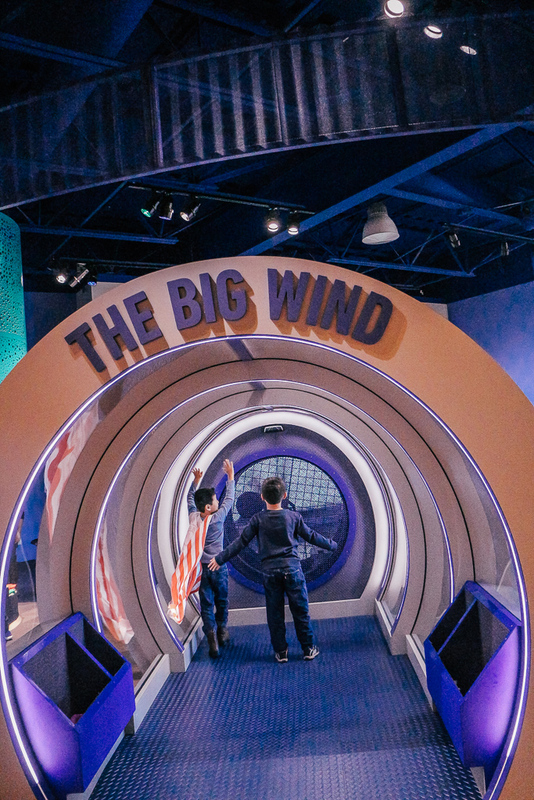 My kids go straight for the stairs when we arrive and head for “Powerball Hall.” Our typical visit to the DoSeum lasts about three hours (although you could easily spend longer) and my boys would be absolutely happy to stay in this area the entire time. There are two other areas upstairs. One is Innovation Station, a robotics area containing various stations that demonstrate a different physical property. 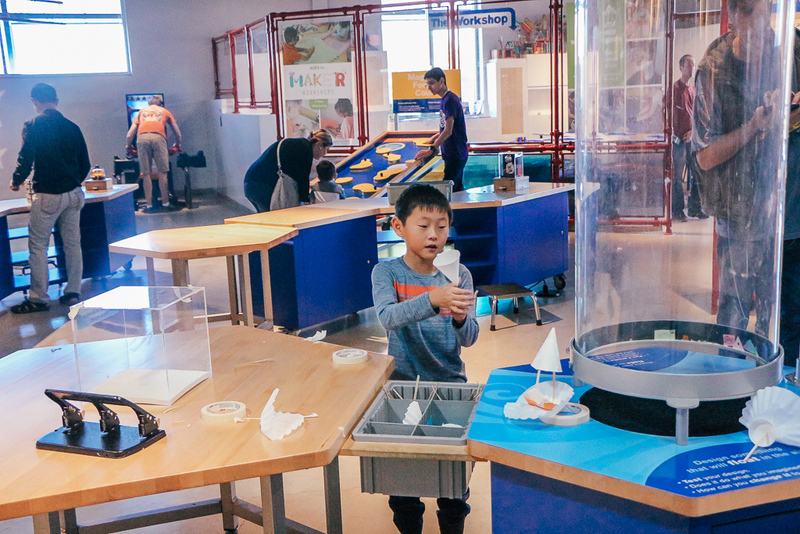 Your kids (okay fine, and you) can experiment with building a model that can withstand impact, craft an object out of coffee filters, paper cones and popsicle sticks that will float, and more. This area contains a lab that offers special, small group activities for kids: younger kids are Monday and Wednesday mornings (under six-years-old) and kids six and up are on Friday afternoon. These activities will change seasonally. Check the DoSeum’s website for more info about Little Doers. Upstairs also contains an area sponsored by CPS, San Antonio’s local energy provider) that offers some hands on fun that teach kids about geography and energy consumption. 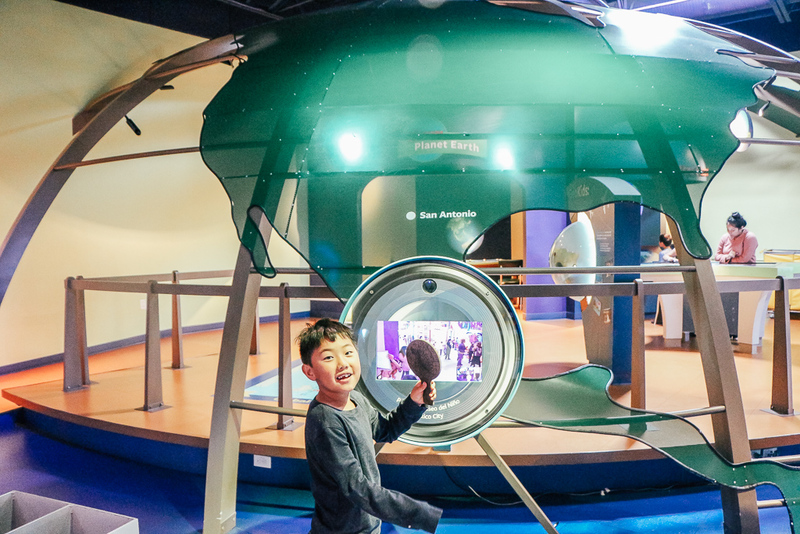 This area also has a two-way viewport to Papalote Museo del Ninon in Mexico City and you can really interact with kids who are visiting that museum. It’s really cool. Downstairs contains Little Town, an adorable area for kids five-years-old and under; the Spy Academy; a reading lab and the galleries where rotating exhibits are located. The current exhibit, Dream Tomorrow Today, is available through January 6, 2019. This is an eco friendly exhibit that shows us how our consumption and waste habits impact our environment and plants the seeds to inspire kids to recycle, re-use, and create a better future. San Antonio is warm and sunny (okay, hot and sunny) most of the year. 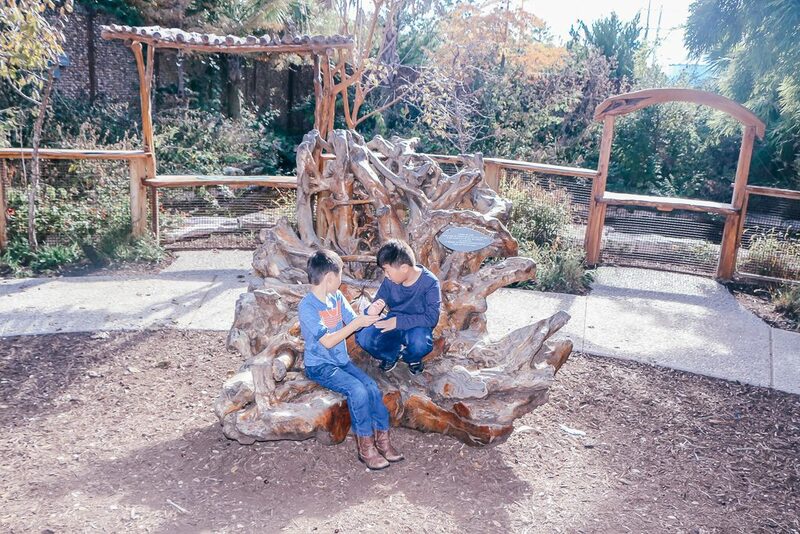 December temps in the 70s are not at all uncommon, so if you’re visiting from a colder climate, you’ll appreciate the outdoor space at the DoSeum and the opportunity to be outside during the winter months. The summer is another story. Even though there is a good bit of seating in the shade, it’s still pretty hot to sit outdoors…I’m talking to you, parents. Your kids will be enthralled with the water play areas and won’t care how high the mercury is creeping, although this is a good reminder to stay hydrated and carry sunscreen, even during the winter. There are several options for outdoor activities at The DoSeum. There’s a water table area that has a lot of STEM inspired activities. 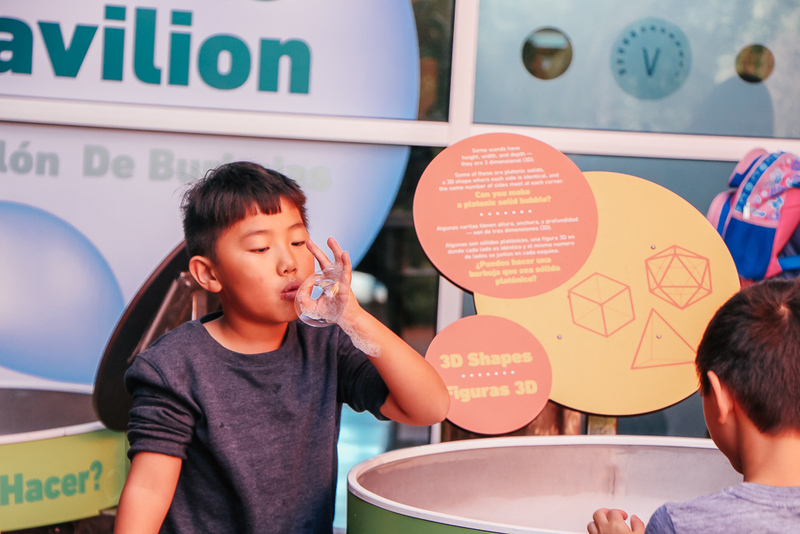 There’s also a bubble station where your kids can blow ridiculously large bubbles. The Storytelling Tree is a beautiful, shady spot that’s perfect for your family pictures. Tucked behind the story tree is an eco pond full of koi. I’ve seen turtles in here before, although we didn’t see them on our most recent visit. 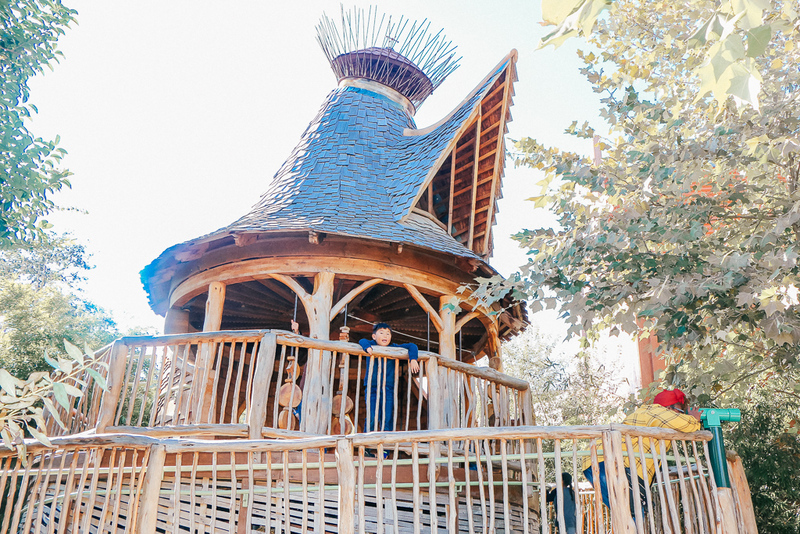 There is a fun tree house with wind chimes inside that can be accessed via tunnel or ramp. The tree house has a great view Will’s Stream, which is a fun place to splash and play when it’s warm. 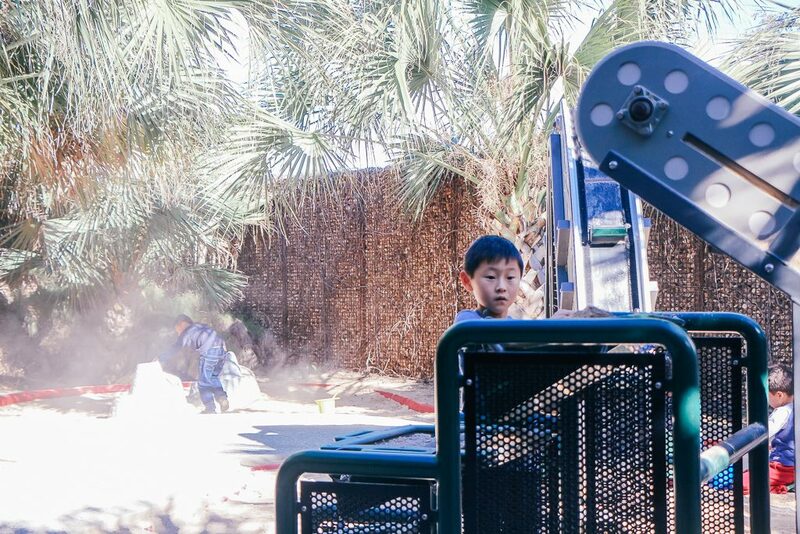 Tucked behind the outdoor seating area is a charming little sand play area. Our most recent visit was our family’s fourth visit since the DoSeum opened in San Antonio three years ago and we have NEVER seen this beautiful and shady little area. Finally, there’s a great outdoor play space with rope challenges, suspension bridges (safe for even the youngest kids) a rock wall and a slide. Most of this area is in the full sun most of the day but there is some shaded seating on the patio. There’s a fun little knoll that parents can sit on and kids can roll on. The turf is artificial, so you can lay down and relax without getting itchy. Two things should drive how you approach your time at the DoSeum: the age of your kids and the weather. If the weather is bad – rainy or one of our rare cold days – you’ll probably want to skip most of the outside exhibits. If your kids are younger, they’ll most enjoy Kid’s Town and Powerball Hall, so plan to spend more time there. Older kids are older will probably enjoy the Spy Academy and the Robotics area the most. I recommend doing an acclimation loop of the DoSeum just to get a full idea of what’s there. 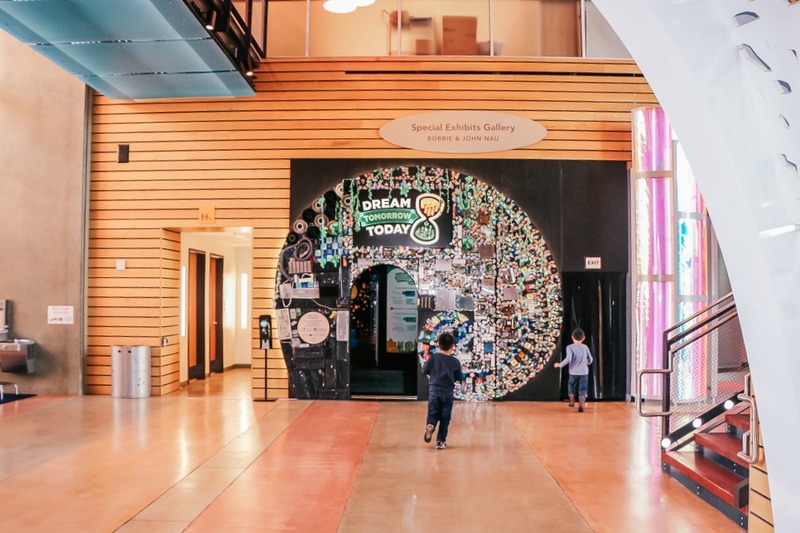 You can (and should) review the DoSeum’s website before you visit but getting a visual on all the exhibits as well as a feel for where everything is located will help make your visit the best it can be. Depending on how much time you have, select what activities you want to focus on. 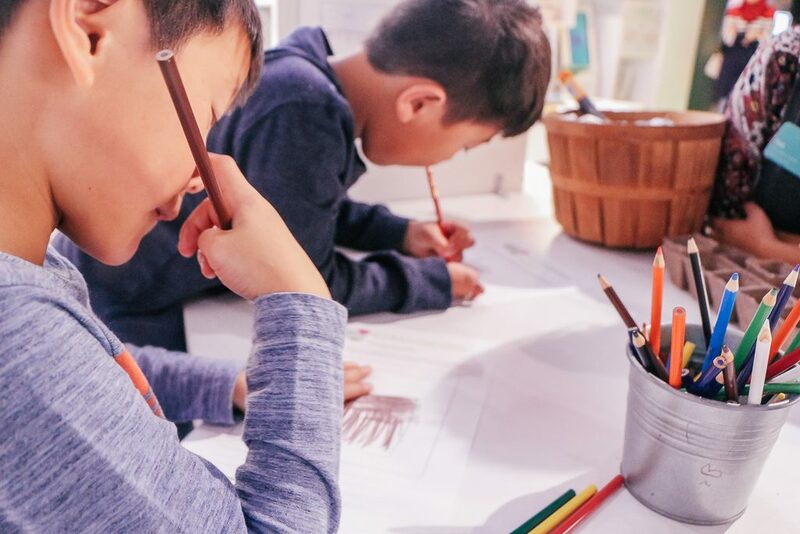 Your kids will easily want to spend at least half an hour on each exhibit and you probably won’t have time to do them all, so pick what your kids want to do most, consider the weather, and have fun. I recommend packing a small bag or backpack with sunscreen, a water bottle, and, if the weather is warmer, a bathing suit, change of clothes and a towel. The water play areas are really fun for kids and you won’t want them to miss out on that. And of course, don’t forget your camera. Simple play clothes and closed-toed shows work best. Kids can get wet, get messy, and run around. Save your fancy clothes for another occasion. The museum café offers some substantial and fresh snacks: sandwiches, salads, soups, macaroni and cheese, quiche, pastries, and beverages. The food is delicious, but I prefer to visit the main Bakery Lorraine location in The Historic Pearl, which is a little over a mile away. There are no shortages of places to eat in this area. Broadway offers a bajillion options for kid-friendly dining. I’ll give you a few of my local favorites (although you’ll find a ton of chain/franchise restaurants in this nearby). This is our favorite place to eat after the DoSeum (or the Witte Museum or the San Antonio Zoo, both nearby) hands down. The décor is cute and quaint and they have the best burgers and shakes. Even if you’re not eating a full meal, pop in for a shake to go. Cheesy Janes offers a huge menu of shakes and malts, with imaginative flavors such as dark chocolate espresso or Nutter Butter. You really cannot go wrong with Mexican or Tex-Mex food in San Antonio. There are too many options to mention but wherever you go, you’re not going to get bad food and I think its simply not possible. Tomatillos Café is nearby and has a good, fresh selection of Tex-Mex favorites and a very extensive margarita menu. If you want home cooking in a relaxed atmosphere, Good Time Charlies is your place. It’s a San Antonio classic, offering burgers and sandwiches and home style favorites, plus a very decent selection of Tex-Mex. There is something for everyone here. Bird Bakery is a San Antonio icon. 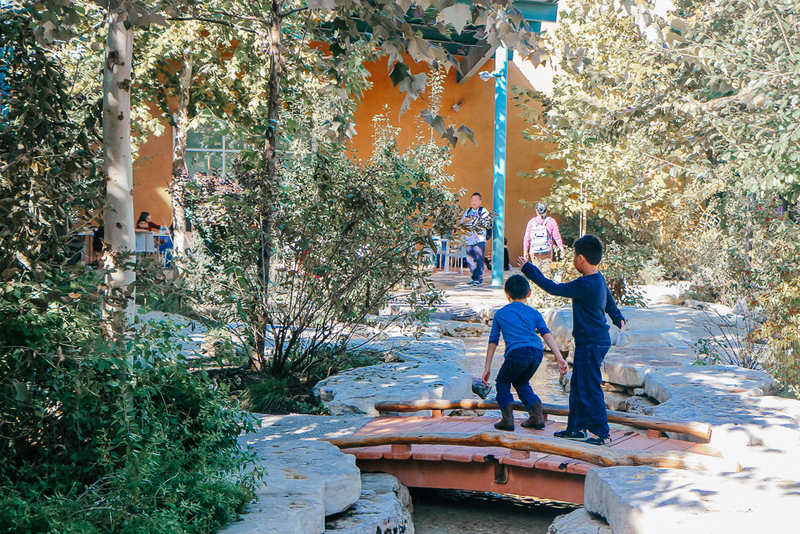 It’s located just a short drive from the DoSeum, but if you don’t go in conjunction with your visit, you should definitely go during your time in San Antonio. Bird Bakery offers a ridiculously good selection of baked fresh daily yummy-ness, as well as some really unique and fun breakfast and lunch fare. If a pimento cheese popover or a crunchy peanut butter sandwich with blackberry jalapeno jam sounds good, this might just be your place. This charming coffee house is tucked off the street view at the intersection of Broadway and Hildebrand, just minutes from The DoSeum. They serve a variety of coffees and teas as well as breakfast and lunch items. They serve brunch on Saturdays but they are closed Sundays. If it’s a nice day, Commonwealth has some lovely outdoor seating. This is a local chain restaurant that serves BBQ and all the side dishes. It’s a counter service/cafeteria style setup, so not fancy at all…and if you’re a BBQ snob, you might be disappointed, but Bill Miller is fast, filling, clean and friendly. They make really delicious dessert, too. You can’t go wrong with any of their pies and their brownies are my favorite. If you’re not a fan of BBQ (and by the way what is wrong with you?) they also serve fried chicken and salads. This is another local chain restaurant that offers “Mexican fast food” and no, not even close to Taco Bell. Taco Cabana also serves beer and margaritas. This is a local fast-food hamburger place that San Antonians are cray cray crazy about. In fact, if you don’t eat at Whataburger when you’re in San Antonio, you probably weren’t even here. If you don’t eat at Bill Miller, Taco Cabana, or Whataburger in conjunction with your visit to the DoSeum, no worries. You can’t swing a dead cat without hitting one of these iconic San Antonio eateries. The DoSeum is very centrally located and you’ll find a lot of other things to do in this area. The San Antonio Zoo, The Witte Museum, Brackenridge Park and Kiddie Park are all located within a couple of miles of The DoSeum. Check out the DoSeum’s website to see what’s happening in advance of your visit. Visiting San Antonio with kids and want more info on things to do? You sold me! I’ve only been to San Antonio with grownups but I should gather up some grandkids for this museum experience. Thanks for the tips. You need to let me know if you’re coming to town! I know all the things!